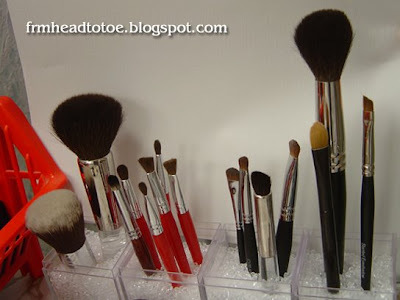 I just wanted to share with you the makeup brushes that I regularly use. I've been getting lots of questions about them, especially the foundation brushes for mineral makeup. This is the setup for brushes in my bathroom. I have the brushes categorized by type. This brush is synthetic and dense enough for an everyday application of minerals. I like the shorter handle (maybe 3") for easier grip and buffing and the hairs are soft. I love this brush. It's so soft and my mineral powder goes on great. Probably my favorite powder brush. Good for creases or making contours. Soft and good quality. Not the best quality, but it's nice to have a few extra brushes for when you want to work with many colors. Great for dense color and the lower half of the lid. The Coastal Scents shadow brushes are really great for packing on eyeshadow. The hairs are really dense and make application really easy and beautiful. Works well for contouring and crease as well as blending. The Trish McEvoy contour brush is soft, but large so mostly used for highlighting or blending. Great for highlighting and all over color. This brush is a Taklon brush, which is the best fiber to use for concealer because the bristles don't absorb the product. To be honest, this brush isn't the softest and I only use it half the time. I just use my fingers, making sure to wash my hands well before application. I'll probably buy a better concealer brush soon. I do recommend applying concealer with a brush over applying with fingers. Very, very soft blush brush! I just really recommend using high-quality brushes for your face because there is such a huge difference on your skin. Love it. I think this is different than the current sephora eyeliner brush. My bristles are natural, not synthetic. Anyway, I love this brush and use it for eyeliners and also to fill in my eyebrows. Everyone should have an angled liner brush in their collection. 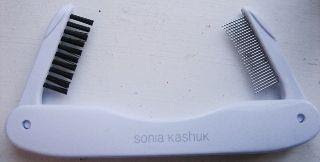 Oh, also if anyone needs a good eyelash comb, go to Target and pick up the Sonia Kashuk retractable metal lash comb. It doesn't break easily like plastic lash combs and it folds in, so it's good for travel. Back before I used Max Factor Lash Perfection Waterproof I had clumpy mascara problems and this tool was amazing! Hope this helps anyone overwhelmed about some of the makeup brushes out there! i love your blog jen. we need to do pics! wow, that is ALOT of brushes. i own like 3 brushes all together HAH. that compartment thing is a neat idea. how you came up with using those bead things is beyond me! But actually, I returned those plastic jars and got a glass container today so I'll be changing it again. woot! Thanks a bunch Jen! Your stuff seems so nice and organized hehe. I was always curious about your brushes! Does the EDM brush shed on your face? My current kabuki does so I'm thinking about getting the EDM one. oh, there's a new pressed all smiles blush! neat! anonymous: The curling iron i use is from the brand jilbere de paris. I think it's 1 1/4" barrel. I want to get a ceramic straightener soon though. What beads did you use in the containers? Sarah: I used flower arrangement filler beads from Michael's. Hello Hello! i was wondering..how do u clean your brushes? I enjoyed your post about the makeup brushes. I noticed that you say you don't have a soft enough concealer brush. At Bella Crush Cosmetics, we have a travel brush kit with 7 taklon brushes (2 face and 5 for the eyes, 1 of which can be used for the lips). The brushes are very soft. You can check them out at www.BellaCrushCosmetics.com. Forgive the website as we are in transition and currently only have 2 products. If you would like to send me your mailing address, I would be happy to send you a package for your review. You may contact me at Trish@BellaCrushCosmetics.com. FYI, we were previously Zana Cosmetics. Look forward to hearing from you.